Have a question? We can help. Look below to find important information and phone numbers to answer your frequently asked questions. Are any Hawaii branches open on Saturday? Our Kalihi Branch is open on Saturday from 9am to 1pm. Please visit our Locations Page to view our holiday closures. Yes, most branches have safe deposit boxes for rent. Please call the branch for availability. Your account number can be found on the top of your account statement (both paper and eStatements). 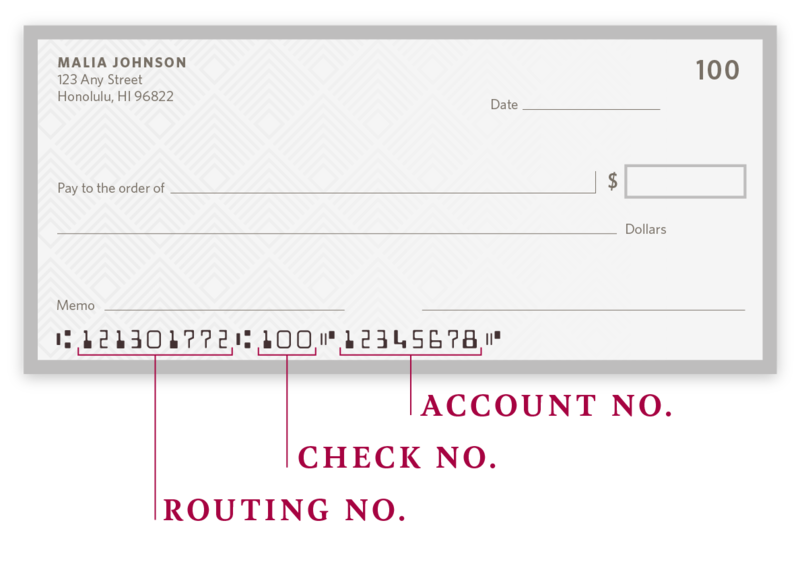 On your checks, the account number is printed along the bottom after the routing number and check number. If you cannot find your account number, please call your branch of account. Please contact your branch to make any changes to your account, including change of address, name change, email address, etc. You may check your balance online, through our mobile app, at an ATM or at any branch. How can I access my eStatements? What is the difference between Monthly Average Balance and Minimum Daily Balance? Minimum Daily Balance refers to the ending balance for each day within the given statement cycle. Monthly Average Balance takes the average of each daily ending balance over the statement period. I noticed an error on my account. How do I dispute a transaction? We’re sorry for this error. Please call or visit a branch to dispute a transaction. I am interested in working at Hawaii National Bank. How do I apply? Please view our open positions on our Careers Page and complete an online application. Where are Hawaii National Bank ATMs located? There is an ATM available at all branch locations. All Hawaii National Bank ATMs are available 24/7, with Bishop Street Branch being the exception. Bishop Street Branch’s ATM is only available during business hours. What are the withdrawal limits at Hawaii National Bank ATMs? The limits may vary by user. The standard limit is $300 per account per day. Please contact eBanking at (808) 528-7800 or eBanking@HNBhawaii.com if you have any questions. There is no ATM fee if you use your Hawaii National Bank debit/ATM card at a Hawaii National Bank ATM. If you use your card at a non-Hawaii National Bank ATM, Hawaii National Bank will assess a $1.00 foreign ATM withdrawal fee. Additional fees may be assessed by the ATM's financial institution. What if my card is lost or stolen? What if I notice suspicious activity? I’ll be traveling and I want to use my debit card. What steps do I take? Please call our eBanking Department at (808) 528-7800 to put a notification on your card. You can also message us through Online Banking by logging in, clicking on the “Options” tab, then selecting “Messages” from the drop-down menu. Please include your travel locations and dates. Yes, we have a variety of credit cards available with different benefits. Please visit our Credit Cards page to see details about each card, or stop by any branch and we’ll be happy to find the right card for you. Can I apply for a business account online? We do not allow business accounts to be opened online at this time. Please call (808) 528-7711 or visit any of our branches. I have a business account. Can I enroll in Online Banking? Yes. Please complete our Business Enrollment Form and email it to our eBanking Department at eBanking@HNBhawaii.com, or take it to any of our Hawaii branches. How do I update my business Online Banking account? Please download and complete the Business Maintenance Form. What’s the difference between Online Banking and Mobile Banking? You can access Online Banking through your desktop or laptop with an Internet connection. Mobile Banking is accessed through the Hawaii National Bank mobile app on your smart phone. To enroll in Online Banking, please click here. Can I make a deposit online? Deposits cannot be made through the Online Banking platform. However, deposits can be made through our mobile app. See the Mobile Deposit FAQ section for more information. I’ve forgotten my Online Banking password. What do I do? I’ve forgotten my Online Banking username. What do I do? Please go to the Online Banking login page and click on the button that says "I've forgotten my Username. What do I do now?". I’m locked out of my account. What do I do? Entering incorrect security information three or more times will temporarily lock your account as a security precaution. Contact us at (808) 528-7800 or eBanking@HNBhawaii.com if you need additional assistance. How do I download the Hawaii National Bank mobile app? You can download the app via the Apple App Store or the Google Play Store. Will I be charged a fee for using the Mobile Banking app? No. Hawaii National Bank offers 24/7 Mobile Banking as a convenient free service for all of our customers enrolled in Online Banking. However, there may be charges associated with data usage on your phone. Check with your wireless phone carrier for more information. To access the Hawaii National Bank Mobile Banking app, you will need an Internet connection. There may be charges associated with data usage on your phone. Check with your wireless phone carrier for more information. How does the device registration process work? Enroll in Online Banking from a desktop computer. Download the Mobile Banking app on your mobile device. Register your mobile device by entering your Online Banking username and password and the last four digits of your social security number or business EIN number. After the device registration process is completed, you may log in to the Mobile Banking app by entering your username and password only. I’m having trouble registering my device. What do I do? Contact us at (808) 528-7800 or eBanking@HNBhawaii.com. I’ve forgotten my username/password. What do I do? Please click on the “Forgot Password” button on your Mobile Banking app login screen and follow the instructions provided. Do I need to log in to view my account balance? No. You can enable the Auto Login option from the Settings menu. This feature allows you to securely view balances and recent history without signing in to the Mobile Banking app. You will need to login to perform any other Mobile Banking functions. We recommend you add a password to your mobile device if you enable the Auto Login feature to provide additional security. Access to the Mobile Banking app is password protected. To ensure your security, contact us at (808) 528-7800 or eBanking@HNBhawaii.com to block your device for Mobile Banking. You can also call your mobile service provider to have your device disabled. Supported Apple devices will allow you to use fingerprint authentication instead of your password to log in to the Mobile Banking app. Do I need to enter my password when I use Touch ID? No. Once Touch ID is enabled on your Apple mobile device, your fingerprint is the only required login credential. You will need to enter your password to make certain banking transactions. Mobile Deposit allows you to conveniently and securely deposit checks by taking a photo of your check with your smart phone and uploading it through our Mobile Banking app. No. Mobile Deposit is a free service for customers. There may be charges associated with data usage on your phone. Check with your wireless phone carrier for more information. What are the limits for Mobile Deposit? What is the processing time for checks submitted through Mobile Deposit? 6 p.m. Hawaii Standard Time (HST). Checks submitted after 6 p.m. HST or on weekends and holidays will be processed as if they were submitted on the next business day. Funds are usually available the next business day. How should I endorse and handle checks deposited through Mobile Deposit? Checks must be endorsed with “For Mobile Deposit at Hawaii National Bank.” After deposit, we will send you a confirmation that we have received an image of the check. Mark the check “Electronically Presented” and retain for your records until the check is processed. Do not resubmit the check. Bill Pay allows you to make payments to anyone with a mailing address in the United States from your Hawaii National Bank account. You can make payments with the Mobile Banking app on a mobile device, or through Online Banking on a desktop or laptop computer. Personal customers can enroll through Online Banking. Business customers need to contact eBanking at (808) 528-7800 or eBanking@HNBhawaii.com. Is there a fee for Bill Pay? Bill Pay is $2.95/month for personal accounts and $5.95/month + $0.29/transaction for business accounts. Log in to Online Banking and access your Bill Pay profile to add payees. Under the “History” tab, swipe left or click on the payment you want to cancel and click “Cancel.” You will be prompted to confirm the cancellation. External transfers allow personal account holders to conveniently transfer funds between accounts they own at Hawaii National Bank and other financial institutions. No, this service is free for personal account holders. Personal account holders can transfer up to $2,000 per transaction, $2,500 per day, and $2,500 per week. External transfers will be processed on the date you specify, and the funds will usually be made available in 3-5 business days. Can I complete an external transfer to an account that is not my own? No, you must be the owner of both accounts. How do I add an external transfer account in Online Banking? After logging in, under the “Transfer” tab, click on “External Transfers”. Click on the “Accounts/Contacts” button on the right side menu, then click the “Add Account” button. Note: You will need to verify the external account by confirming small deposits made into the account. How do I add an external transfer account in Mobile Banking? After logging in to the mobile app, click on the menu icon in the top left corner.